First an update: it looks like we have found a way to get people to the lower crossing site safely–though not without some bushwhacking and the inevitable and attendant afflictions of ticks and such. We should be able to announce the date firmly soon. We are working with Spotsylvania County on this, and so we do not have total control on when the tour is done. For prior posts about the middle crossing site, click here and here. In anticipation of that, we include a couple more views of the crossing site. 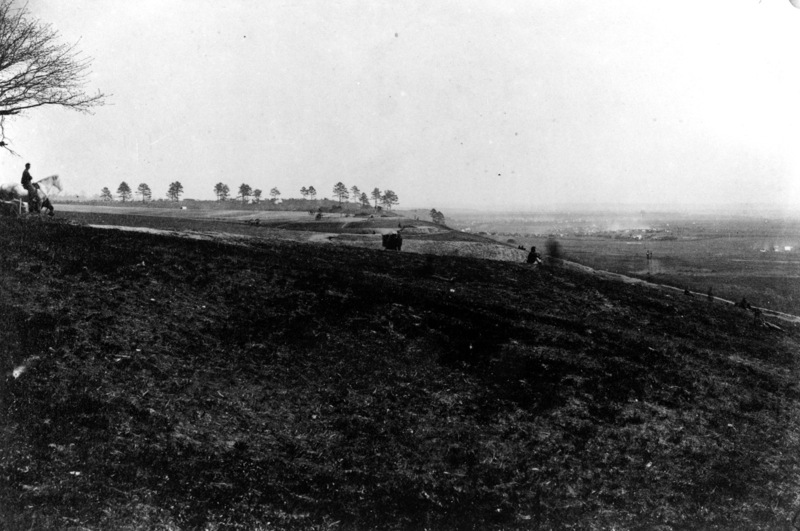 The first, above, is taken from the Stafford side looking southwest in May 1863. Like most of these images, this one has a multitude of little details worth noticing. Clearly visible is the extensive cut made in the river bank to create one of the ramps on the south shore. One would wish and think that some evidence of the huge berms on each side of the ramp might survive, but not so–at least not that we saw. Look at the many impromptu hitching posts on the far side, some of them occupied, some of them not. 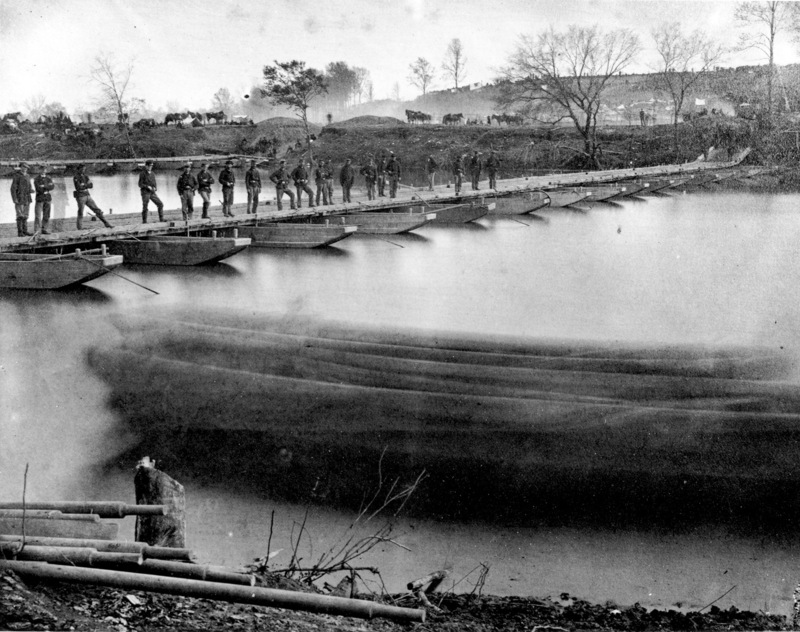 The image includes a great view of unarmed soldiers posing on the near bridge. These men were likely members of the 15th New York Engineers. Look too at the details of their bridge–essentially very simple structures, with anchored boats, the balks that connected each boat to the next, the cross-planks (chesses–each 13 feet long), and the side rails. A bridge like this could be built in just a few hours and taken apart in less than 60 minutes. Finally, here’s another image, though admittedly not a very good copy (we do not have a scan of the original). 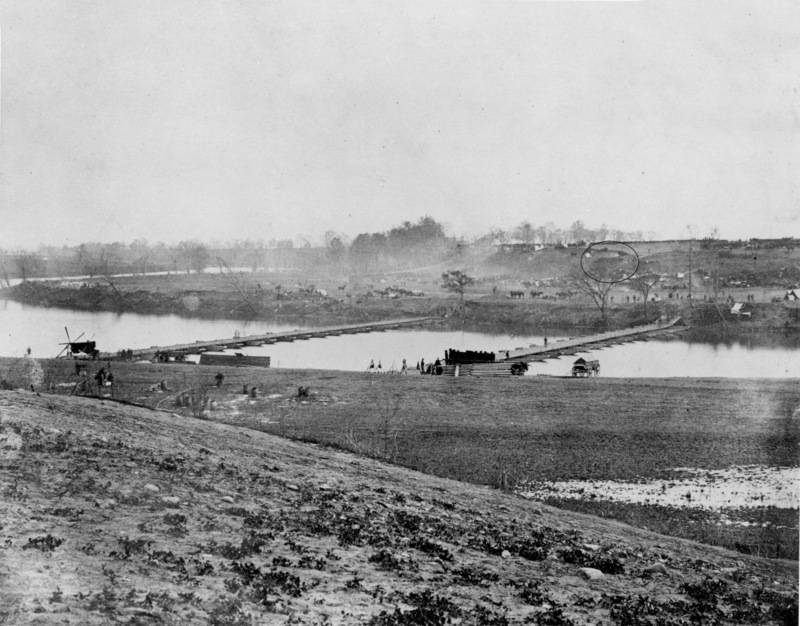 It’s another of the series taken by Andrew J. Russell in May 1863, this one looking back across the river toward the Stafford shore. 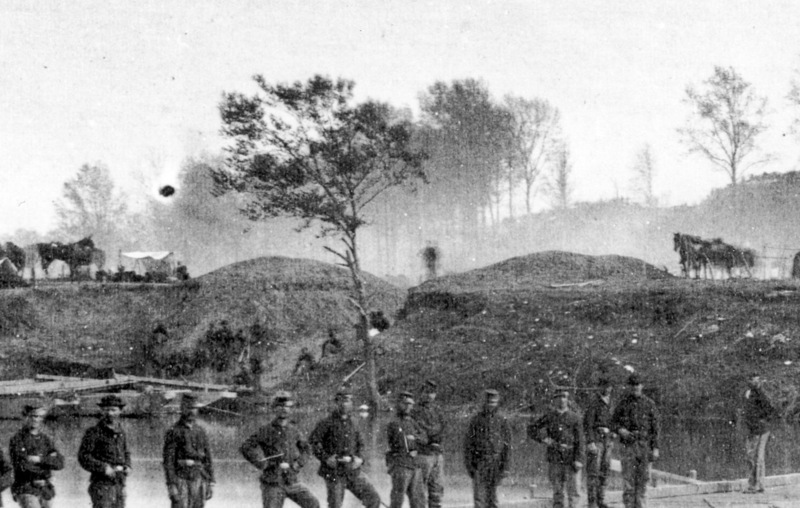 Once again, members of the 15th New York Engineers are visible in the foreground. We will use all these and more on our tour in May, and will probably share a few more as we get closer to the date. Lee’s Hill is Stop #3 on the Fredericksburg Battlefield self-guided driving tour. Historically, it was known as Telegraph Hill for the Telegraph Road (present-day Lafayette Boulevard and Business US Route 1) ran across its crest. The hill derives its current name from the fact that Confederate General Robert E. Lee established his command post here during the December 1862 Battle of Fredericksburg. Its eastern slope was cleared of trees, although covered with brush. At 243 feet above sea level, Lee’s Hill provided a commanding view the Rappahannock River plain from beyond Marye’s Heights to Hamilton’s Crossing. From here, Lee watched the Battle of Fredericksburg unfold below him. Sketch made by Frank Vizetelly, artist for the Illustrated London News. The sketch is looking from Lee's Hill towards Marye's Heights. Note the unobstructed view. 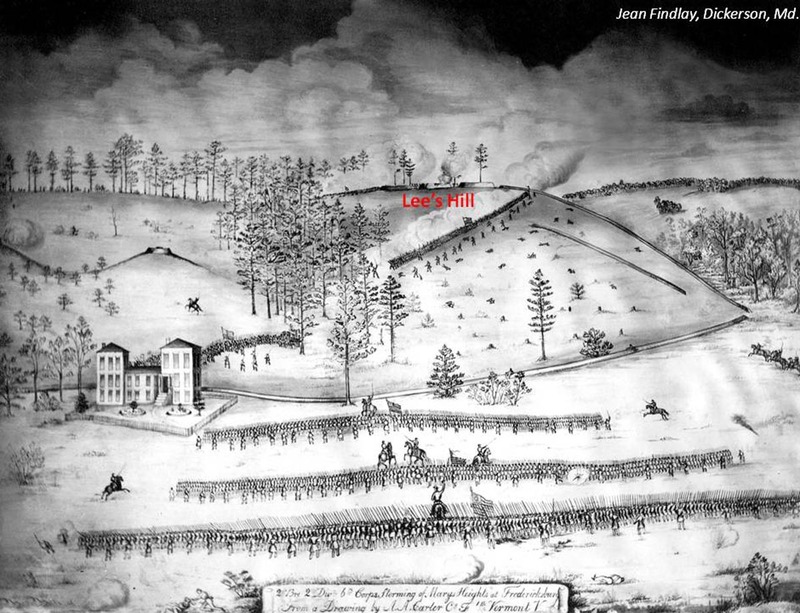 During the May 1863 Second Battle of Fredericksburg, a depleted Confederate force yielded Lee’s Hill to attacking Union troops who fought and scrambled their way to the crest. 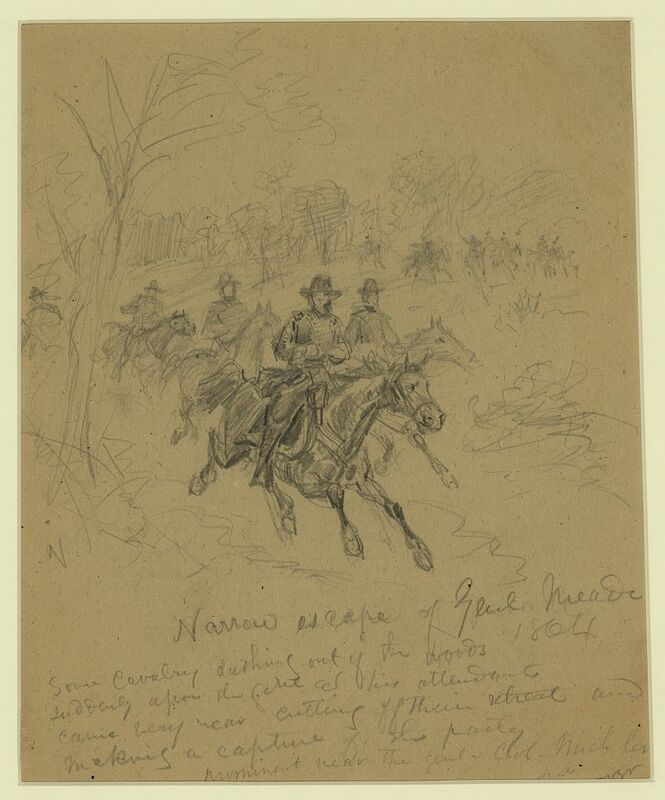 A sketch made by a Union soldier in that attack clearly shows an eastern slope devoid of trees. Sketch made by Albert A. Carter of the 4th Vermont Infantry. The scene depicted is the successful Union attack against Lee's Hill on May 3, 1863. 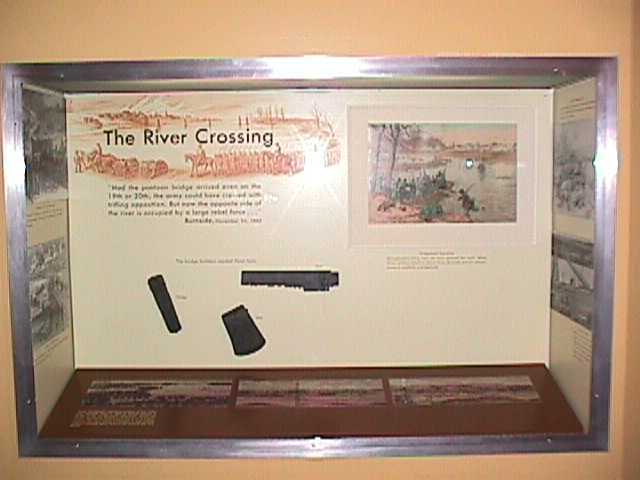 A typical exhibit at Fredericksburg. – The existing exhibits were installed during the Centennial of the Civil War, nearly fifty years ago. – Since then, the park has only once received a comparable amount of funding for any single project intended to enhance the visitor experience–the Sunken Road restoration, completed in 2005. Indeed, the amount of funding for these exhibits probably exceeds ALL of the combined funding available for the development of interpretive media in the last fifty years. 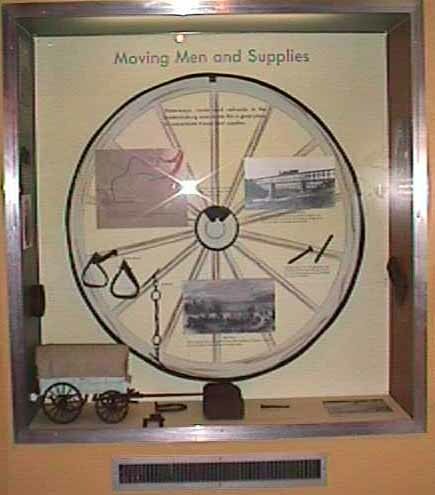 The Fredericksburg exhibits are classic examples of media from what the NPS called Mission 66–the 50th anniversary of the NPS in the 1960s. The importance of media–exhibits, films, publications, digital stuff–is often dramatically underestimated. Fewer than 20% of the park’s visitors ever take a guided tour. While that’s still a fair number of people, the fact remains that 80% of our visitors are entirely dependent on media for getting our story, for understanding the significance of what otherwise might appear to be typical Virginia landscapes. As it is, visitors get Civil War History 1960s style–in terms of both design and content. We hope that every one of our visitors who enter one of our buildings will get something out of the new exhibits–at least if we do them well. 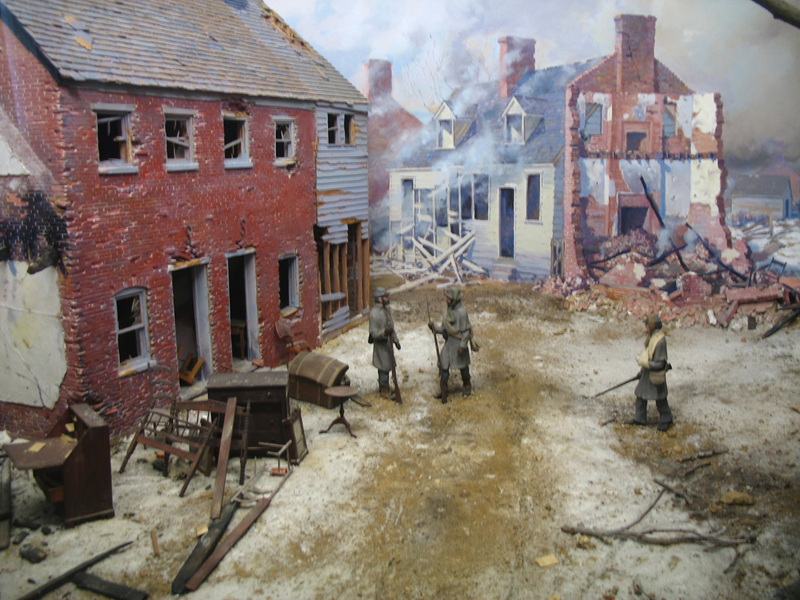 The fabulous diorama at Fredericksburg, which will be incorporated into the new exhibit. High-Ranking Skedaddle: a Previously Unidentified Sketch of Spotsylvania? A high-resolution version is here. Narrow escape of Genl Meade Some cavalry dashing out of the woods suddenly upon the genl & his attendants came very near cutting off Their retreat and making a capture of the party. Prominent near the genl., Col. Michler on a rough track or farm road that wound along the foot of a tree covered knoll out from which came the rebs to cut them off. This image clearly shows the roads heading up the ridgeline. They cannot be seen today, but their locations can be determined. Last week we had the unprecedented opportunity–thanks to the folks at Spotsylvania County–to explore the Spotsylvania side of Franklin’s Crossing (often called the Lower Crossing because of the three Union crossings at the Battle of Fredericksburg, it was the farthest downstream). 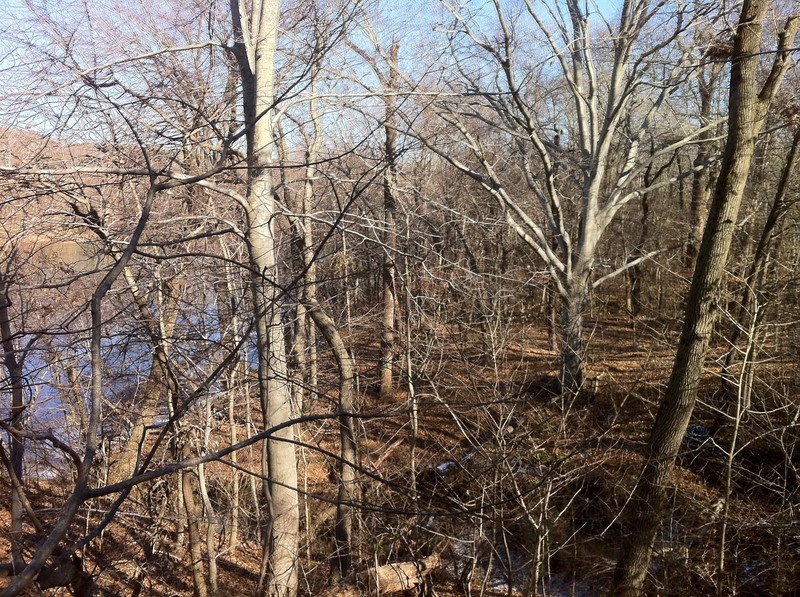 It was here, in December 1862, that the left wing of the Union army (commanded by William B. Franklin) crossed the Rappahannock on its way into battle. Likewise, in May 1863 and June 1863 Union troops crossed at this site. 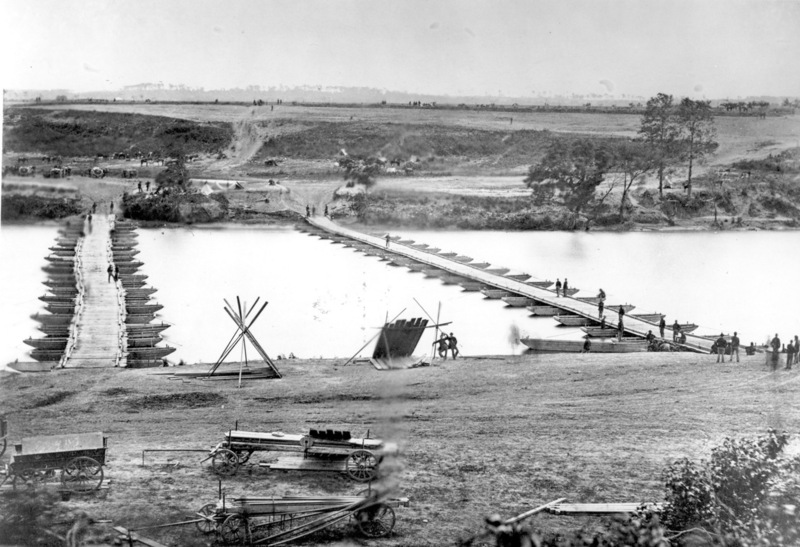 In fact, the Union army built a system of pontoons here again in May 1865 too, for the passage of the Union army as it headed back to Washington for the Grand Review. This was a busy, important place. Another 1863 view, looking slightly downstream in the direction of Mannsfield. It’s always exciting to see something you have never seen before; it is doubly so to see something few people have explored before. The site is behind the Bowman Center–an industrial area–off Route 2/17, about a mile south of Fredericksburg. From the land side, the site is completely inaccessible to the public. We gained access by the graces of Spotsylvania County, which operates a sewage treatment plant that is tightly fenced. It helped greatly that we had county staff along with us, else we doubt they would have let us through. We reached the site by walking along a fairly narrow path between a fence and the veritable cliffs–probably 65 feet high, virtually straight down–that border the river just west of the crossing. Please accept our apologies that the site is heavily wooded today and difficult to photograph. The view toward the crossing from the cliff’s end. Looking east. Photo by Eric Mink. Photographer Timothy O’Sullivan pulled an impressive and enviable media coup on May 21, 1864. From the balcony of Massaponax Church in Spotsylvania County, O’Sullivan recorded three of the most famous images of the Civil War. 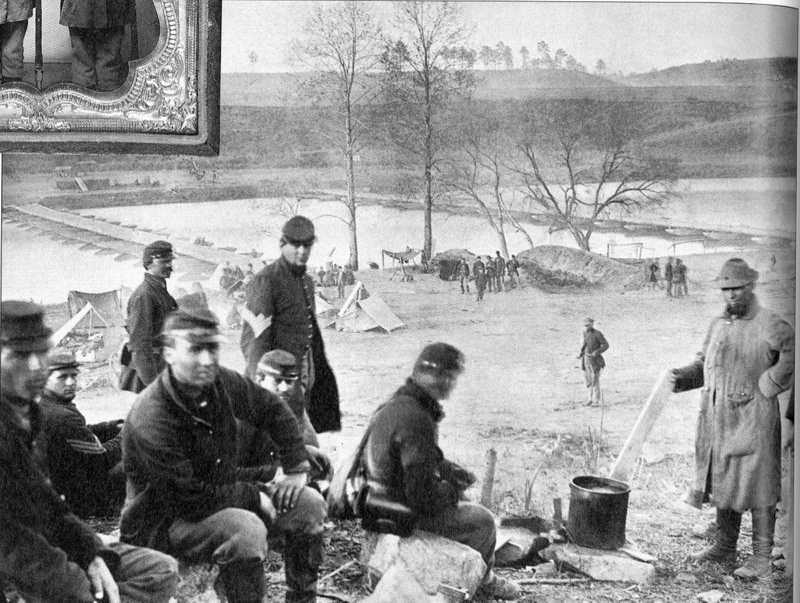 This series of photographs focuses on Generals Ulysses S. Grant and George G. Meade during a rest along the march from the battlefield of Spotsylvania Court House to the North Anna River. Pictured above are two of the three photographs taken by O’Sullivan that afternoon. Gathered in the pews outside the church are the two generals, members of their staffs and others traveling with army headquarters. 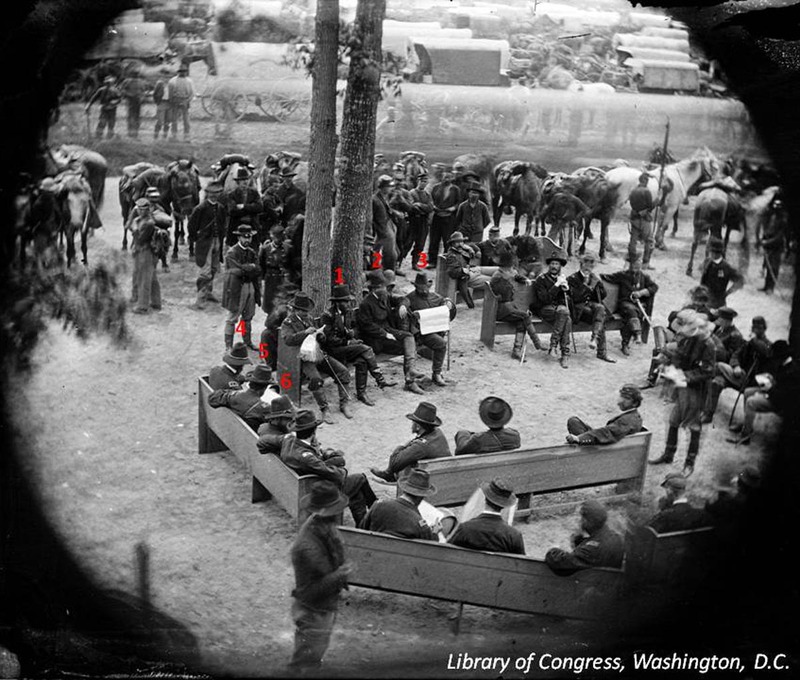 (I have identified General Grant in each image by a red mark.) In the first photo he is seen leaning over a pew conferring with General Meade, while the second photo shows him seated and presumably drafting an order or dispatch. Visible in the background can be seen the blurred wagon train of the Fifth Army Corps, as it passes the church and continues south. The third photo, below, presents the clearest image of the famous generals and prominent members of their staffs . Identified in this photo are: 1) Lieutenant General Ulysses S. Grant, Commanding General United States Army; 2) Assistant Secretary of War Charles A. Dana; 3) Brigadier General John A. Rawlins, Chief of Staff of General Headquarters United States Army; 4) Major General George G. Meade, Commanding General Army of the Potomac; 5) Lieutenant Colonel Cyrus B. Comstock, aide-de-camp to General Grant; 6) Lieutenant Colonel Adam Badeau, Military Secretary to General Grant.